More than 20 million people have been touched by Jesus Calling®. 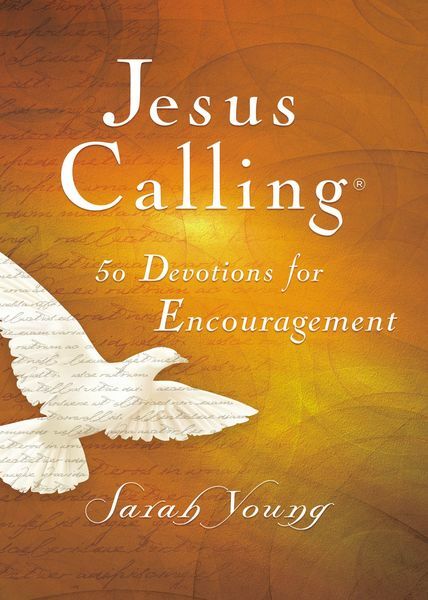 Experience Sarah’s words in a new way, focused on the encouragement only Jesus provides. The Jesus Calling topical devotionals—releasing simultaneously—each feature 50 readings from Jesus Calling with relevant Scripture verses on the topics of comfort, peace, and encouragement. Even the tiniest hill can feel like a mountain when you’re drained or discouraged. But that’s when your precious Savior reaches out His hand with compassion and draws you near. Jesus Calling 50 Devotions for Encouragement is written as if Jesus Himself is speaking hope and encouragement directly to your heart. Readers around the world already love how Sarah’s words connect with them on a daily basis. Now the new Jesus Calling topical devotionals offer a way to focus even more deeply on the major felt needs in your life . . . and in the lives of your friends, family, church, school, and co-workers. With a beautiful, vibrant cover and stunning four-color photography, this topical devotional is a natural addition to the Sarah Young brand—and the perfect way to pour into those you love.